Rafael Plaza (Sevilla, 1989) has covered more than one hundred tournaments on the professional tennis circuit, including every Grand Slam, numerous David Cup finals, and Masters 1000 and seven editions of the Masters Cup. For six years, he has been gathering information on Rafa Nadal, and has recounted many of his most important triumphs as special correspondent in various places in the world where the champion from Majorca has reigned. During his career, he has interviewed the best players in the world, has given an inside view of the most exciting trials on the tennis circuit, and has witnessed firsthand the historic rivalry between Nadal and Roger Federer. 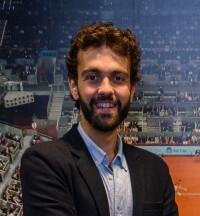 He continues traveling to the most important tournaments and is part of the International Tennis Writers Association (ITWA), covering Tennis for the newspaper El Español and on the radio for Onda Cera.